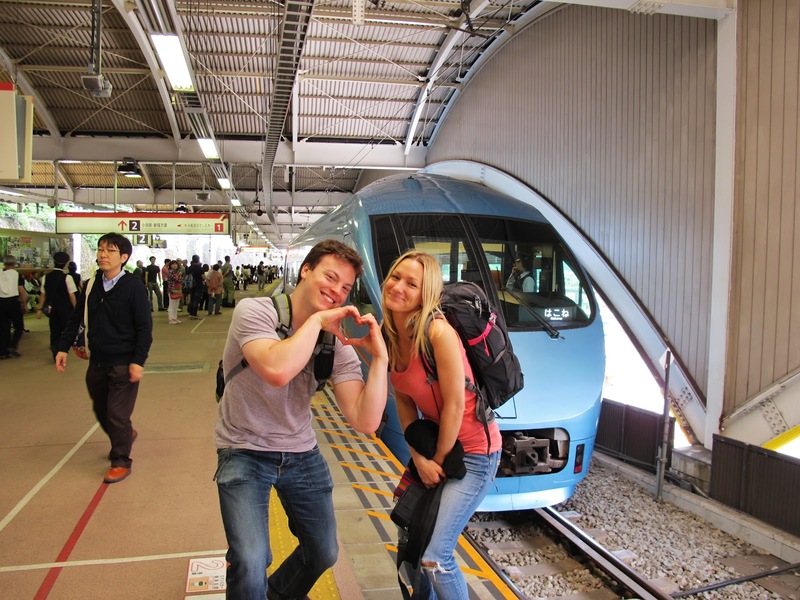 Getting to Hakone from Tokyo is half of the fun when you ride on the romance car into Hakone Yumote station. Views of the Japanese country side are beautiful from the train. We love the romance car, and especially its name! With beautiful views of Mt. Fuji, majestic mountains, and charming hillside hotels there is no better day or weekend trip out of Tokyo than to Hakone. This post is all about the train ride over and will be the first of a series of write ups about Hakone. Among the many places I have traveled to in Japan including Kyoto, Osaka, Tokyo, Kanagawa, etc. Hakone is my favorite. Getting to Hakone is fairly simple. If you are coming from central Tokyo simply board the Odakyu Railway Romance Car bound for Hakone. The train ride is 70 minutes long and you will get off at Hakone Yumoto station. To check train times and details go to Hyperdia.com and search for a train bound for Hakone Yumoto station. Once at the station to board the romance car, mine was at Machida, you need to purchase a reserved ticket to board the train. This ticket will cost 600 yen and will give you a reserved seat number. Don't think that you can save money by hopping on the train and avoiding the man that comes to check tickets. Yes, sometimes he doesn't come, but we did this on the train ride home because we thought we could simply pay for a fair adjustment because we were to lazy to go buy a ticket before hopping on. But instead, the man made us pay for a ticket on the train and we had to pay a 300 yen penalty fee. So make sure to buy your ticket from one of the ticket machines at the platform, or before you get to the platform. The machine is very easy, just select English. There was a nice woman working there that helped us out at the station in Machida and quickly purchased us 3 tickets so we could board the train that left in just 2 minutes. Enjoy the luxury train ride over! I strongly recommend taking the train over during the early morning hours or during the day so that you can get a view of the Japanese country sides! You will ride past plenty of rice fields, green mountains, and picturesque houses and neighborhoods. Riding on the romance car is extremely comfortable. The seats recline, and the train was quiet and smooth. Romance car trains are definitely one of the nicest style trains in Japan and they are perfect if you are traveling with a date, hence the name (romance car). Riding through the country side is extremely romantic, and the romance car makes it even better. On the train, you can purchase food and drinks from a lady that will come buy and take your order. A beer costs 300 yen, so if you want to save money, stop at the convenience store before hopping on the train and bring your own snacks. Everyone on the train busted out sushi and rice bowls, and a few purchased items from the train attendant. Once you get to Hakone Yamote, I recommend heading out of the station to the Hakone information center. Here you will find women ready to help you with any questions about sight seeing in Hakone. They will provide you with detailed maps and time tables of buses in trains in the area. Next door to the Hakone information center you can buy your Hakone Free pass, or you can buy this in Shinjuku and it will include the price of your train ticket. 1) One round trip from the Tokyo area to Hakone by Odakyu Railways, unless you purchase the pass inside the free area, e.g. at Odawara, Hakone-Yumoto or Mishima Stations. 2) Unlimited use of Odakyu affiliated buses, trains, boats, cablecars and ropeways within the Hakone free area. 3) Discounted admission to selected tourist attractions. Prices and image courtesy of www.japan-guide.com. The bathrooms on the romance car. I strongly recommend buying the Hakone Free Pass if you want to see 2 or more of the famous attractions in Hakone. You will get unlimited use of the trains, boats, cable cars, etc. We went on the pirate boat a total of 4 times and used all of the cable cars. To get too and from our guest house, we also used our hakone pass to take the bus. The great thing about the pass is that it is good for 2 days. So its great if you are going for a weekend trip from Saturday to Sunday. Check back soon for more details about my trip to Hakone! I will write about the attractions, guest house, onsen (hot springs), food, etc. Showing our love for the romance car! True love found on the romance car! Riding back home on Sunday evening from Hakone to Kanagawa.